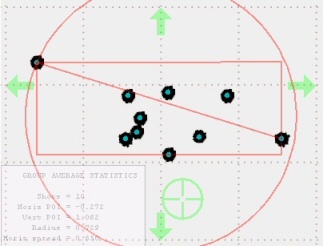 Shotgun-Insight made measuring shotgun pattern targets easy. By automatically counting pellet marks and performing rigorous statistical analysis Shotgun-Insight made possible in minutes what was otherwise near impossible. Shotgun-Insight is helping to reveal the secrets of shotgun patterns that have been hidden for over 100 years. Rifle and Pistol Insight provides a similar benefit to rifle and pistol shooters. By calculating the statistical spread of the shots a much more reliable estimate of the true performance of the gun and bullet is found. The traditional measure of extreme spread is quick and easy, but often misleading. Why Rifle & Pistol Insight should be used . . . The traditional extreme spread measurement can be very misleading! Consider the two groups below. The group on the right is clearly 'better'. But if the extreme spread measurement is used (the red diagonal line in the pictures) both groups measure the same. "Loose group" shot on 1" x 1" grid. "Tight group" shot on 1" x 1" grid. "Loose group" with extreme spread shown. "Tight group" with extreme spread shown. The average spread measurement is more useful (but hard to calculate by hand) . . .
By measuring the average radius, a much better estimate is made of the group size and the likely size of group that would be obtained if the gun was shot again. The difference in average radius is shown by the green circles in the pictures below. "Loose group" with average spreads and average radius shown. "Tight group" with average spreads and average radius shown. Note the smaller indicated group compared to the "loose group". Calculating the average spread is time consuming by hand, but easy by computer . . . Shown below are the steps a shooter would need to go through to calculate the average spreads and average radius shown in the pictures above . . .
Hand calculation of average radius. Measure the horizontal distance of each hole from the edge of the target. Add the distances and divide by the number of shots. 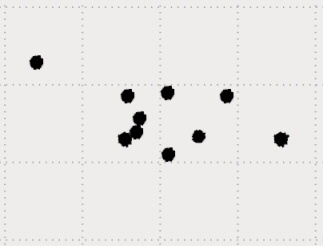 This is the average horizontal distance. Repeat for the vertical distance from the bottom of the target. Mark the average horizontal and vertical distance on the target. This is the average Point of Impact (POI). From this average POI measure the distance to each hole. 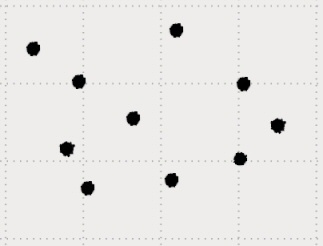 Add the distance and divide by the number of holes. This is average radius. Want the horizontal variation (standard deviation)? Repeat steps 5 & 6 but measure each horizontal distance, square it, add them altogether and divide by the number of shots minus one. Square root this number and you you have the horizontal standard deviation! Want the vertical variation (standard deviation)? repeat step 7 for all the vertical distances compared with the average. Want the standard deviation of the radius? Repeat step 5 but subtract the average radius obtained from step 6 and square the resulting distance for each bullet hole. Add all these squared numbers together, divide by the number of holes minus one then square root the result. You now have the standard deviation of the average radius!
. . . Earlier generations of shooters couldn't be bothered doing all the above steps. Now, thanks to computers and digital cameras you can get all the above quickly and easily. 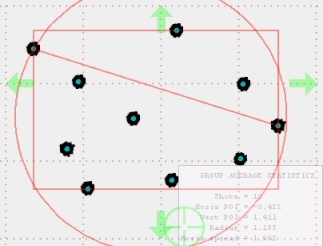 Rifle & Pistol Insight calculation of average radius. Take a digital picture of the target. Load it into Rifle & Pistol Insight.